With iOS 5, Storyboards represent a significant change to how we, as developers, construct our user interfaces using Interface Builder. So far my experience of Storyboards has been extremely positive however, resources are thin on the ground and with this post I hope to pass on some of my initial experiences. For a walk through of some of the basics and common pitfalls check out my YouTube video. I have also recently created a practical example around todo lists with a backend system and a full explanation of how to use Storyboards in a working application please check it out here. There are several key concepts that this article will cover the first is the concept of the Scene. 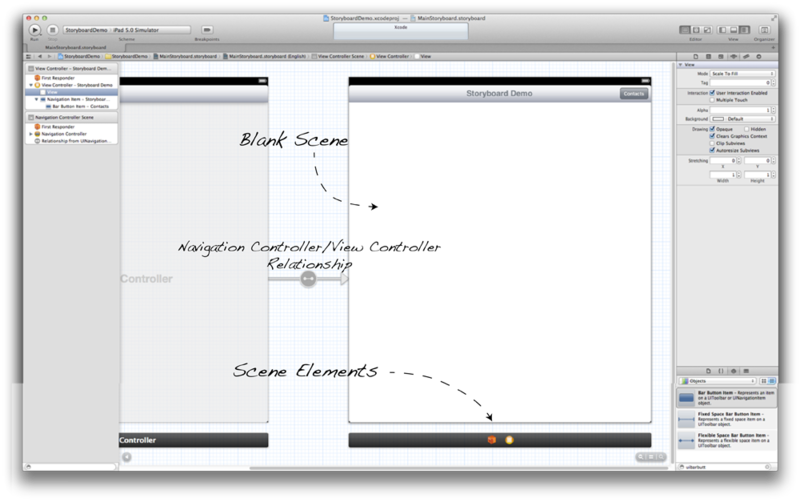 Within Storyboards every UIViewController represent one screen of content. These scenes are linked together with Segues, these define the transitions between one scene to another. You can specify how you wish this transition to be made by using one of the preset transitions, Push, Modal and Popover or you can also create your own custom transitions which can bring a very unique and specific look/feel to your application. As previously stated a scene represents one screen of content. 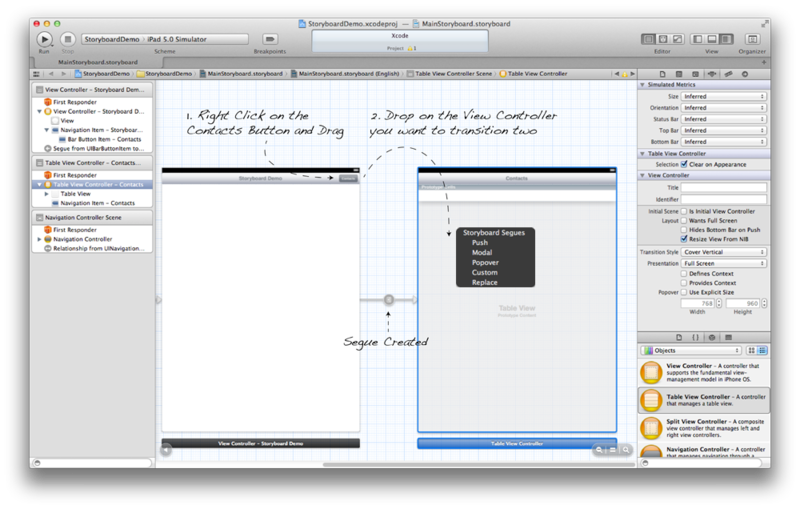 You can embed these scenes in UINavigationControllers or UITabBarControllers by dragging on a UINavigationController or a UITabBarController and dropping your UIViewController into it or alternatively, choose Editor->Embed In in the Xcode menu and choose there relevant component. Using the Embed In method is very handy and prevents you having to rejig things in your storyboard particularly when you have created several different Segues. In the image below you will see an example of a blank scene that has been placed within a UINavigationController. The relationship between the UINavigationController and the ViewController is shown by a relationship link. To construct transitions between scenes we use Segues. These are created by right clicking on the element that will initiate the transition and dragging over to the scene we want to transition to. In the image below you will see the popup that appears allowing you to specify the transition type and the resulting Segue created. In this case I have created a push Segue. As a result whenever someone clicks on the contacts UIBarButton the ContactsViewController will be pushed onto the screen without the need for any additional code. To pass the ContactsViewController data we must implement the prepareForSegue method. 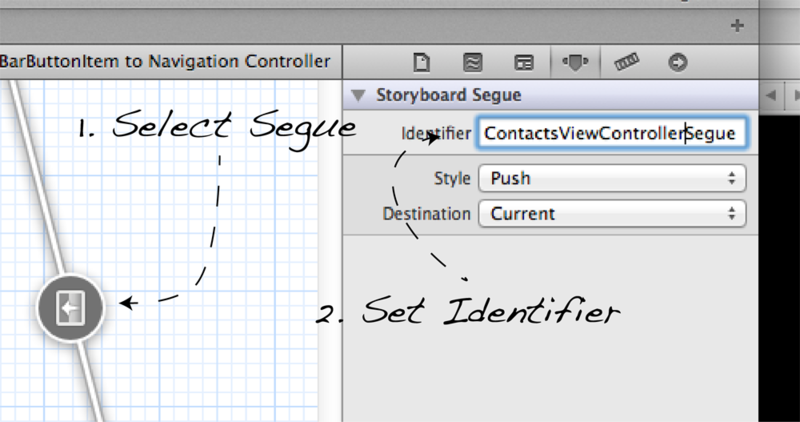 First we have some setup we have to do in Interface Builder so that we can identify which segue has been executed. The Segue identifier can be set in the Attributes Inspector. Now in your prepareForSegue method you can identify which Segue has been executed and provided the destinationView with the correct information. Now we know what the destinationViewController is we can set its data properties. To receive information back from a scene we use delegation. Both are shown simply in the following code snipped. A final note about UIStoryboardSegue is that when you choose a popover transition you must get access to the popover in order to dismiss it. You can get this by casting the Segue to a UIStoryboardPopoverSegue but only after you have checked the identity of the Segue to ensure you are making the correct cast.